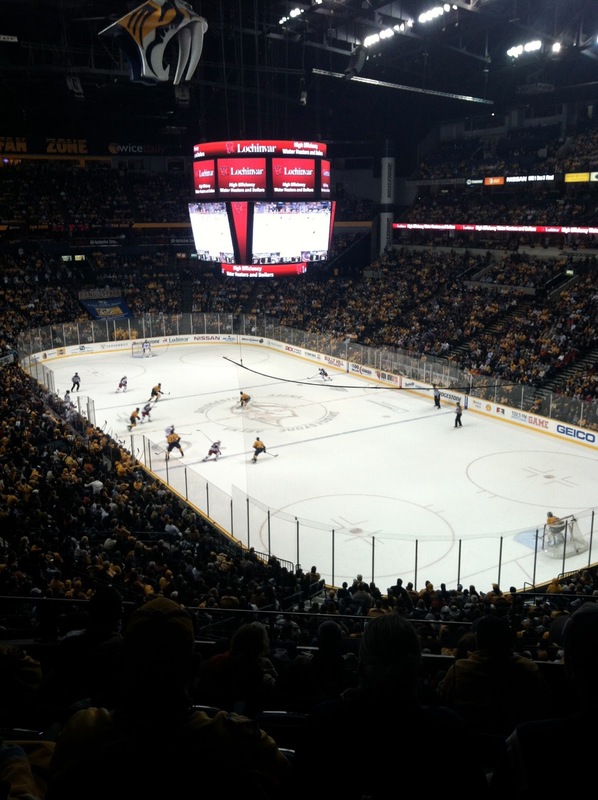 Always Aubrey: Nashville Predators: My First NHL Game! The Nashville Predators are big around here... Welcome to Smashville! So when there was a raffle at work for tickets to attend the season opener, I was definitely curious. I knew Duke was a big Pittsburgh Penguins fan, so I figured an NHL game would be a fun date. And wouldn't you know, I won us some great seats! The Predators place in Bridgestone Arena, which also hosts some of the biggest music acts in town; Justin Bieber had played the night before. It was my first time in that venue, and it was exciting. I didn't realize that hockey was so fast-paced; I guess I'd assumed since it was low-scoring, it was more like soccer or something. Definitely wrong! I really enjoyed watching the game, which ended in a tie even after a thrilling shootout. I learned that shootouts make me anxious! But I like how casual the atmosphere is, how everyone's drinking beer and shouting, and how the whole place had a home team energy. It was also exciting for me too because THREE of my friends made it onto the jumbotron! It made me feel like a real local. :) Two were coworkers, and one was my local BFF, VB. I later found her in the arena so say hello to her and her Mom; they're both hockey fans, but VB is die-hard for the Predators. She's met most of them, calls them out by name, and spends most of the game standing and yelling. It's awesome. Glad she was there for my first game too!